As a child, Halloween was never one of my favorite holidays. Still isn’t. But as an author I deal with the birthing of monsters even in Christmas stories. Monsters of a different sort. I’m a grandmother in her 72nd year of life whose memories of the birthing process are vague to say the least. But even after 47 years, I recall snippets: the discomfort of a growing belly and the physical changes that came with it; the mood swings and teary-eyed frustrations and fears; and the kicks and punches my babies delivered as I lay down to sleep. How can I forget the anxiety of the first labor pains, the disbelief when they reached their peak, and the fear they never would end? With a single full-length novel to my credit, The Calling of Ella McFarland, and two novellas—A Christmas to Remember and A Christmas Measure of Love, which are paired in my recently released A Rock Creek Christmas Collection—I claim no expert status. But I can offer the insight of a novice midwife of sorts—one who facilitates the birth of multiple characters, some who emerge with ease and others who battle their way onto the page, monster-like. What delight to lay heroines like Ella and Lily in my readers’ arms. Ella in The Calling of Ella McFarland and A Christmas to Remember bears all the markings: beautiful, courageous, faith-filled, and strong. And with a kind heart that softens the sting of a sharp tongue. But like DNA, inexplicable in its complexity, even a heroine can carry a seed of … something else. How strangely gratifying to pull from long-ago memories the monster Walter in The Calling of Ella McFarland. And to revisit his cruelty in A Christmas Measure of Love. Wrapping Walter in swaddling clothes and presenting him to readers forces me to face my own hidden frailties. But other characters—like Lily—challenge me in different ways. In A Christmas Measure of Love, I ask myself if I’m delivering a living, breathing young woman or a puppet. Nine years after The Calling of Ella McFarland ends, is Lily sitting on a shelf with crumpled limbs? Does she dance to a preordained tune? Or have I, the midwife, clipped the strings and let her breathe? As an author I try to birth heroes, monsters, and some in between, but never puppets. So my journey of midwifery for each story begins with the Myers Briggs Personality Types inventory. I refer to the inventory to create believable, memorable characters and to create conflict. Does Ella’s extroversion overwhelm Lily, the introvert? Will a particular life experience aid or hamper the meshing of Lily and Adelaide Fitzgerald as friends? Will Ma’s ever-certain discernment between right and wrong bring faith-resistant Lily to straight-arm God or bend a knee? And how in the world will Lily’s secrets not destroy a character as loving and patient as Cade McFarland? What will it take for her to understand how to measure love? My latest project, A Christmas Measure of Love, not only revisits the work of a monster, but it examines love, as well. This story springs from memories of my mother’s love, my own love for my daughter and her children, and from knowledge of the far-reaching tentacles of spousal and child abuse, the worst of all horrors. Nowhere in God’s creation did a truer, nobler, or fuller human love exist than in my mother’s heart for me. She begged the Lord in tears for one baby girl. His answer—“Wait”—caught in her craw, but in His perfect timing, the Lord gave her the desire of her heart. Linda's mother holding her as an infant. Mother insisted on what I needed, not what was popular. She eyed me like the ever-hovering blackbirds over the cornfield. And she watched for me to arrive home from dates, flipping the porch light and sometimes appearing unannounced and uninvited at past-curfew events. She passed on to me her love of family roots and her stories that have waited patiently to be told. I hope they meet her approval. Mother’s unfeigned faith dwelt first in your mother, Ella, and in her mother, Louisa. I pray I’m handing down a faith no less true, no less honorable, and no less brave. My heart remembers. It always will. And I hope readers will remember the stories as well. Ultimately I view the midwifing of characters as neither a puppet assembly line, a Play-Doh party for 4-year-olds, nor the work of a grand Creator. Turns out, it’s a delivery process as flawed as myself and my memories, as messy as family, as unavoidable as life, and as fulfilling as a labor of love. Lord, You alone are perfection. When You provided free will, You offered a solution as well. Thank You for making us neither heroes, nor monsters, nor puppets, but simply Your children. Use our flawed words for Your purposes in The Greatest Story Ever Told—Yours. For Jesus’ sake. 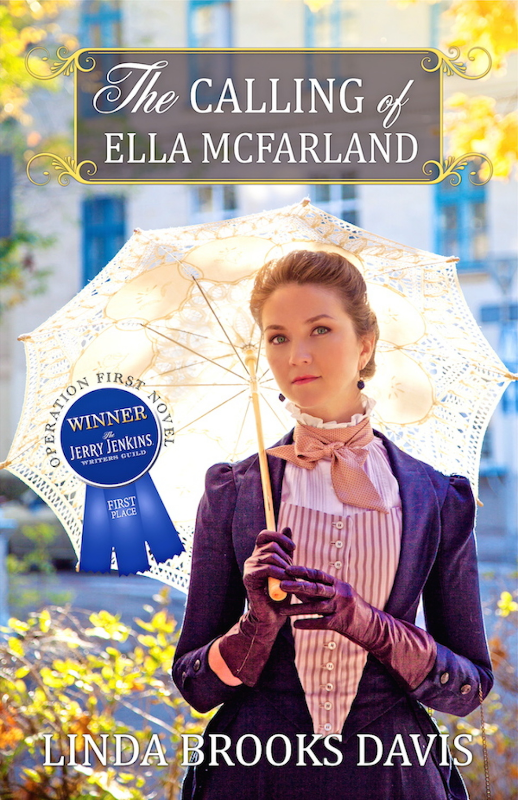 As the 2014 Jerry B. Jenkins Operation First Novel Award recipient, Linda is grateful for the release of The Calling of Ella McFarland by Mountainview Books in December 2015 and the American Christian Fiction Writers Carol Award in 2016. Linda and her husband, long-time members of San Antonio’s Oak Hills Church, delight in their veterinarian son and daughter and dote on six grandchildren. Linda loves to chat with readers. Email her at linda@lindabrooksdavis.com. Is it Really Just Stuff? Copyright 2016. All rights reserved. All text and images are the sole property of Linda Sawyer, unless otherwise stated. Link-backs and shares are encouraged, but do not claim this work as your own.